Bangkok’s river has always been and will always be the bloodline of Bangkokians. 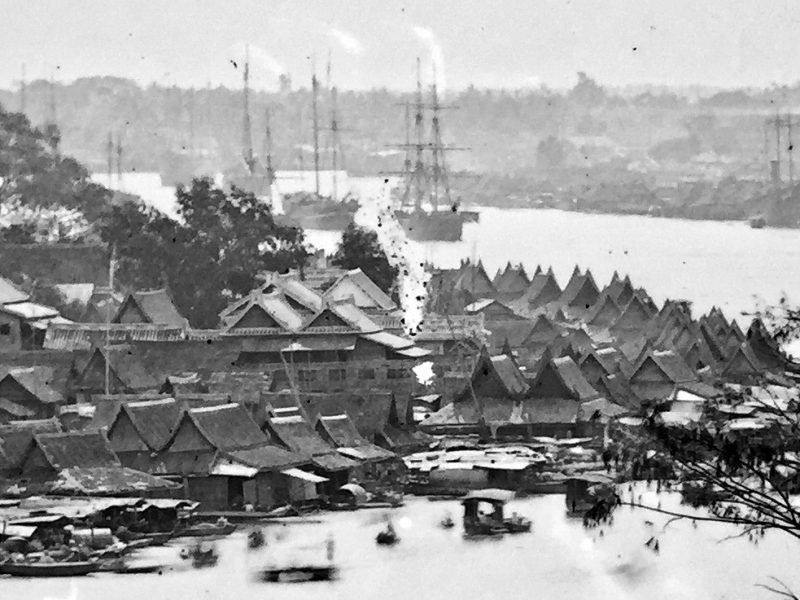 For hundreds of years, it has provided all that is required for locals to live and driven the original settlement to prosper into present day Bangkok. Aptly named Mae Nam Chao Phraya, the river is the original nurturer of Bangkokians. In Thai, Mae Nam is a generic term for river with Mae signifying mother and Nam water. The Thai royal and noble title Chao Phraya may be translated as Grand Duke. The two terms together truly reflects the reverence Thais have for this river. Bangkok traces its origins back to the 15th century when it began as a small village under the rule of the original capital of Siam, Ayutthaya. Early settlers chose the original site because of the land’s fertility and the water’s abundance of fish. Due to its strategic location near the river’s mouth, the settlement soon grew in size and importance by serving as a customs outpost. In 1767 following the fall of Ayutthaya to the Burmese, King Taksin relocated the country’s capital to Bangkok on the western banks of the river in the area now known as Thonburi. In 1782 King Rama I, finding the eastern banks more favorable, founded modern Bangkok and celebrated the occasion by building some of the world’s most beguiling structures and landmarks such as the Grand Palace and Wat Phra Kaew. Canals or khlongs, natural or manmade, began to innervate the city and contributed significantly to the cityscape and the inhabitants’ lifestyle. Bangkok soon earned the epithet ‘Venice of the East’. 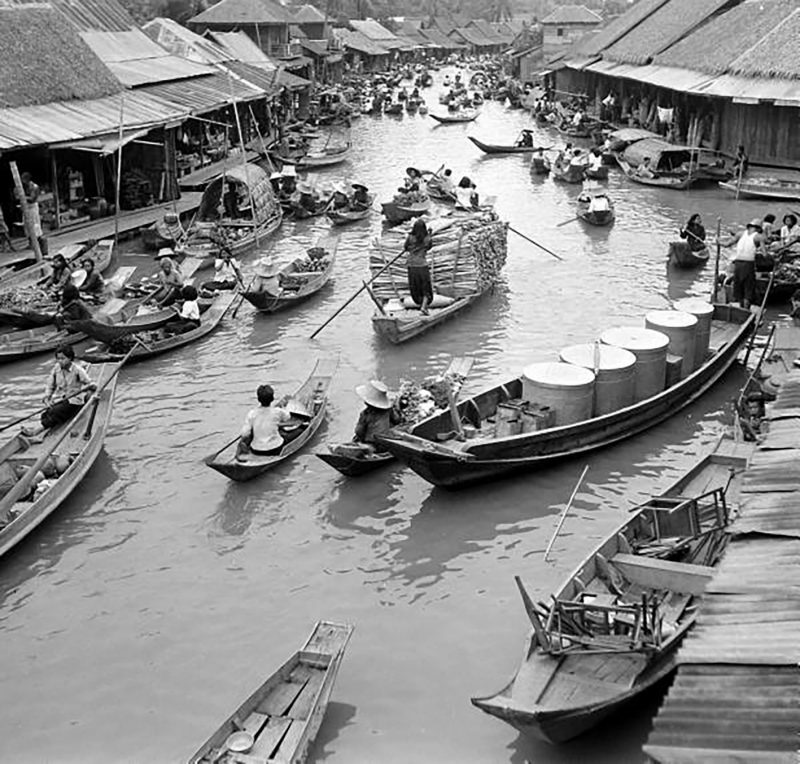 Bangkokians then traveled by its waterways and often met on floating markets – a truly unique way of life. 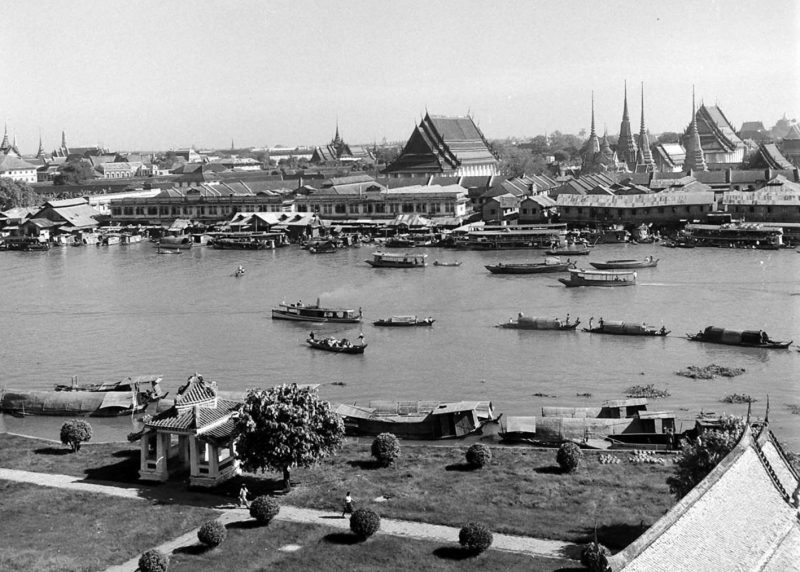 Eminent Western authors such as Somerset Maugham, Joseph Conrad and Noel Coward later singled out the Chao Phraya as one of their favorite spots in the Far East. Like all thriving urban centers of the world, Bangkok has transformed much since its birth. The city has expanded far beyond the river’s banks. However, locals still live, work, and play along the Chao Phraya. More than 50,000 people still use its ferries every day. Slow barges bearing cargo move inexorably upstream. Children still frolic in the russet-brown water and wooden shacks, mottled by the elements, lurch often precariously at the water’s edge. The banks’ landscape and way of life has also grown vertically. Soaring hotels and condominiums hem in solemn temples, churches and civic buildings that look 19th century European while yards away a wooden sampan sells noodle soup or dried squid to hungry river workers. It is this juxtaposition of calm and chaos, modern and traditional, religious and secular, ugly and sublime, foreign and indigenous that makes the Chao Phraya so evocative. Like all urban rivers, the fate of the Chao Phraya is intertwined with the city through which it flows. Truly, the River of Kings – as King Rama I nicknamed it – is what made Bangkokians who they are today. The source of the Chao Phraya is in the north of Thailand where the Ping, Wang, Yom and Nan rivers merge to form an estuary at Paknam Pho District in Nakorn Sawan Province. It flows southwards through Uthai Thani, Chai Nat, Sing Buri, Ang Thong, Ayutthaya, Pathum Thani, Nonthaburi and Bangkok before reaching Gulf Of Thailand in Samut Prakarn province. 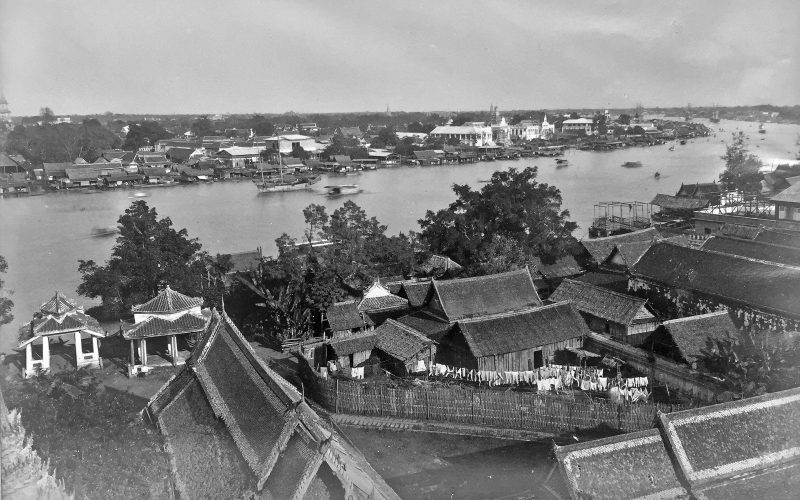 In the distant past the areas in front of Thammasat University that follow the banks of the river stretching downward to Wat Arun Ratchawararam were actually one piece of land without the river flowing through as it does today. During the years 1534-1546 Somdet Phrachai Rachathirat, the King of Ayutthaya, instructed that a canal be dug to create a short-cut in the area of the narrowest neck of land, starting from the mouth of Bangkok Noi canal to the mouth of Bangkok Yai canal. He named it Khlong Lat Bangkok (Bangkok short-cut canal). The Chao Phraya River today remains the most important waterway for the people of central Thailand. The river is an important transport link for the shipping of teak and rice to Bangkok. Locals have made the banks their home since ancient times and created their livelihoods from its environment. It is no wonder that the river is regarded as the bloodline of Thai people. Today, locals living along the Chao Phraya River banks maintain an authentic lifestyle. The river also plays an important role in Thailand’s vibrant festivals such as Loy Krathong, held every November when thanks are expressed to the god of water, and Songkran – the Thai New Year celebrations.